A futuristic rail system featuring track-less trains and virtual lines was launched in a Chinese city yesterday. 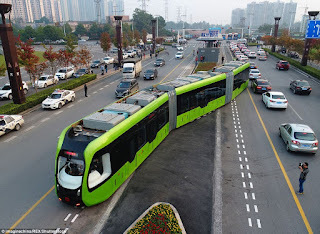 Billed as the world's first 'smart train', the vehicle runs on virtual rail lines through the bustling streets of Zhuzhou in China's Hunan Province, reported People's Daily Online. The train could travel as quickly as 70kmh, or 43 mph, and carry as many as 300 passengers. 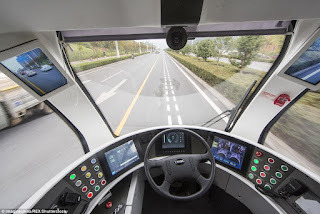 The rail system, called ART or Autonomous Rail Rapid Transit, has been developed by China's CRRC Corporation Limited, one of the world's largest train manufacturers. 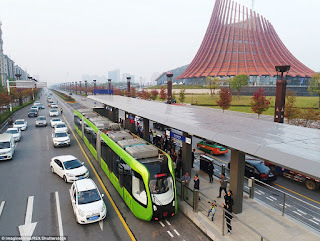 It's set to speed up public transportation of Zhuzhou, a city with about four million residents, before being popularised to other parts of China. 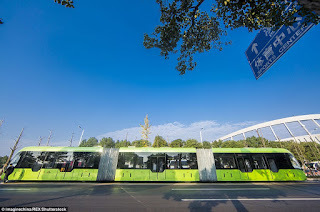 The train, sporting sleek livery, is somewhat a hybrid between a long bus and a traditional tram. 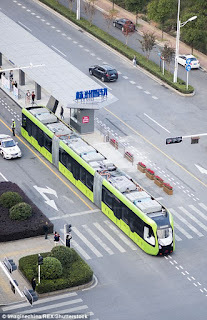 It could carry much more passengers than a bus and unlike a tram, it doesn't run on physical railway tracks. The invisible railway measures 3.75 metres (12.3 feet) wide and is embodied by dotted lines painted on the road. 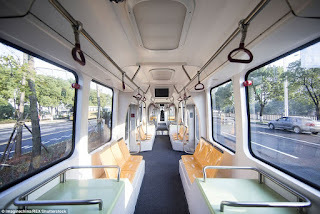 According to Feng Jianghua, chief engineer of the train, the virtual railway system is much cheaper to build compared to a tram or subway system. 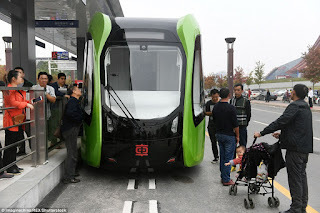 Mr Feng said it would cost 150 to 200 million yuan (£17 to 23 million) to build one kilometre (0.6 miles) of tramway in China, but with the high-tech virtual line, the cost would be reduced to 50 to 100 million yuan (£5.7 to 11.4 million) for the same distance. Mr Feng also said the train identifies the pavement and has various sensors to collect travel information. 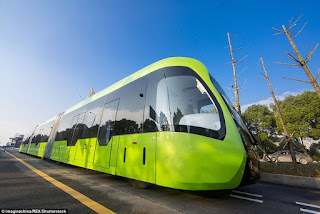 Three 'smart trains' are being tested on the road of Zhuzhou. The rail line is set to open officially next Spring. The trains are expected to be automated in the near future.